Make singing this round even more fun with this colorful visual! 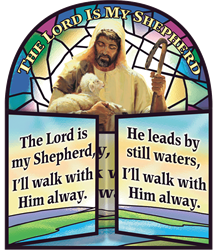 When the doors are opened beneath the stained glass window, the refrain reminds the singers to walk with their Good Shepherd always. The trifold design also allows you to use this card-stock visual as a stand-alone, beautiful reassurance of the Good Shepherd’s care for his lambs. The second verse on the back of the visual encourages children to trust their Shepherd to help them live a life pleasing to God. Includes sheet music. Preschool–K4, gr. 3–4.